On October 11, 2012 superstar evangelist Billy Graham emerged from semi-retirement to pray with, and in effect endorse, presidential candidate Mitt Romney. 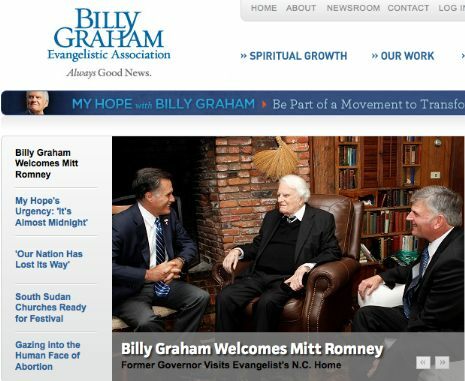 Then, on October 12, the LGBT rights group The New Civil Rights Movement broke the news that even as Graham was meeting with Romney, a page on the website of Graham's nonprofit the Billy Graham Evangelistic Association identified Mormonism as a "cult". "A few years ago, my wife, Nellie Jo, and I traveled across America listening to Christians who formerly held other beliefs. We heard from Christians who were once Mormons, Hindus, Jehovah's Witnesses, agnostics, witches, Buddhists, Unitarians, New Agers, Muslims, Satanists and non-Messianic Jews." Adding to the punch of this, Thom S. Ranier is CEO of LifeWay Christian Resources, the publishing wing of the Southern Baptist Convention, which claims 16 million members. As I go into in my article, LifeWay prints a number of books that attack Mormonism. But wait! - There's more. While the BGEA scrubbed the article that the New Civil Rights Movement pointed out, the idea that Mormonism is a cult appears to be coded right into the BGEA website! I'm not joking. A search on the term "Mormon" on the BGEA website returns six hits. One is the article mentioned above, by Thom S. Ranier. Then, there are another three articles that discuss cults, but these three pages don't contain the word "Mormon", nor are the words "Mormon", "Mormons", or "Mormonism" in the page metadata. What does this mean? Well, in order for the website search engine to return these three pages, that discuss cults, in response to a search for the term "Mormon", the people who coded the website would have to had programmed the result into the search engine: in other words, told the search algorithm to associate the word "Mormon" with "cult". "This couple keeps coming to our house and inviting us to come to their assembly hall to study the Bible. I'd like to know something about the Bible, but a friend of mine says this group is a cult. What exactly is a cult? They seem like nice people." "A cult is a group that claims that it, and it alone, has the truth about God and offers the only way to salvation. Members reject what Christians have believed for almost 2,000 years, and substitute instead their own beliefs for the clear teachings of the Bible. Often, they add to the Bible by claiming that the books their founder wrote or "discovered" are from God, and have equal authority to the Bible. In reality, however, those books deny what the Bible says about God or Jesus, or about the way of salvation." Nowhere does Graham suggest that said "cult" might be any particular belief, such as Mormonism, but that's unnecessary. It is well known that the Church of Mormon recognizes the new books of the Bible discovered in the early 19th Century by founder Joseph Smith - it's even been the subject of a recent Broadway play smash hit. Billy Graham's own website is automated so that Christians who search for the term "Mormon" will get this page result and be informed, straight from Billy Graham himself, that the Mormon Church is in reality a cult. It's that simple. This is a case of the pot calling the kettle black. Both are coercive and deceitful. refused to answer any questions from CNN's Piers Morgan about Mormonism and whether it is a Christian religion. FG kept repeating that he wasn't going there. I suspect FG was trying to avoid talking about it at all because he was afraid he'd go over the edge into excoriating Mormonism as a "cult". I suspect it's also a sensitive issue because the NAR's version of Christianity has borrowed so much from Mormonism that it is open to many of the same critiques - indeed, Billy Graham's definition of "cult" fits the New Apostolic Reformation just about as well or better than it fits Mormonism. "A cult is a group that claims that it, and it alone, has the truth about God and offers the only way to salvation." By this definition--Billy Graham's own--Christianity itself is a cult. Defining cults gets people onto very thin ice. Personally, I've always liked the definition in Wiley's Dictionary in the comic strip B.C. : A cult is the church down the street from yours. In classic sociological and anthropological definitions, cults tend to revolve around one or several charismatic figures, and are organized in concentric rings, with an inner circle of acolytes closest to that figure/those figures wielding the most power/having the most authority. In that view, most religions (Christianity included) begin as cults, and the ones that successfully evolve into religions (such as Christianity and Mormonism) eventually develop fixed doctrine, established ecclesiastical hierarchy, and so on. the definition used by Rick Ross and others... which is based on the coercive and abusive nature of the groups that we fight against (and there are others - and by their definition a cult doesn't have to be connected to a religion). Another term I've heard for cult is "Coercive Religious movement" but as I mentioned, there can be business-oriented cults and others. There is the anthropological definition, which is on a spectrum of religious organizations (let's see if I get this right) - sect, cult, denomination, religion. I know the definition but it doesn't even come close to my experiences with the Assemblies of God, the NAR, and the Southern Baptists. The Moonies and the Scientologists are classic cults in the definition that I use, and I understand a lot of exit counselors consider the groups we fight as being at least as coercive and destructive as those groups, if not a lot worse. The concentric rings is a good point and a characteristic that I'd include in my personal definition... I'd forgotten about that (it has been more than 7 years since I've read anything about the anthropology of religion - not my interest). as a determinant in the definition of a cult. The filters you describe reminded me of a tongue-in-cheek method linguists use to define the difference between a language and a dialect: A language is a dialect with an army and a navy. Yes, I left out the coercive aspects. of an evaluation frame that was developed by the late Isaac Bonewitz back in the late 70s. This has been one of the best metrics I've seen thus far for identifying cult-like practices.